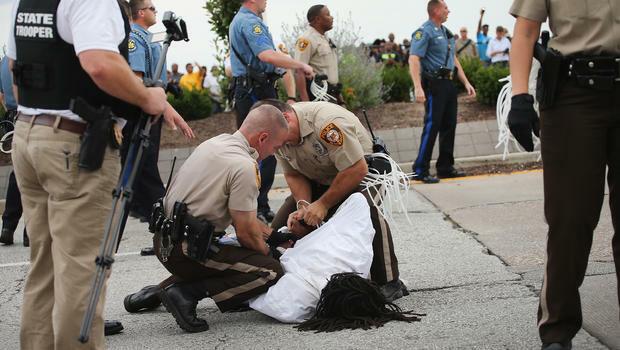 Use of Force - Proposal From "Think Tank"
Police arrest a demonstrator during a protest along Interstate Highway 70 on September 10, 2014 near Ferguson, Missouri. WASHINGTON -- A police group's proposal that law enforcement officers be required to do more than what's minimally required by law in violent encounters has spurred anger and pushback from leading national groups representing chiefs and rank-and-file sworn officers. The Police Executive Research Forum, a Washington-based think tank, last week unveiled its 30 new principles that re-envision how officers use force after national outrage over questionable shootings and violent arrests. Recommendations include an unprecedented acknowledgement by police professionals that officers should go beyond the Supreme Court-adopted basic legal standard that asks what a reasonable officer would do in such situations, and encourage officers to focus on preserving all lives, not just their own. Another recommendation was that officers should imagine the public's perception to their response in a potentially violent situation. But such varying standards leave a police department open to civil liability and claims. Training - and adhering to it - becomes more critical, said retired Los Angeles Police Department Sgt. Lou Salseda, an expert and former police academy instructor.